Creating a professional portfolio will be the most essential element alongside your beauty industry education and an important step in establishing your career as a Professional Freelance Makeup Artist! A portfolio is the key that all of your clients (potential, current, referrals, and more!) will view to determine if you are the right fit for the job at hand. Building a strong portfolio with a professional team that shares your individual vision and has the ability to represent your work the way that best expresses the specializations you wish to pursue will be the first step in creating content for building your best portfolio. Always remember, your portfolio initially will take some time to build as you gain experience; start small and build upon your work. The best portfolios are a tool that is consistently growing and will always be updated! In fact, it is of utmost importance that it continues to be updated regularly with client work and creative work to stay current by showcasing new skills and techniques to your range of expertise! After you have created the best content, a clean and minimal website that showcases your best work will be one of the most essential marketing tools that you will have available to you as you grow your business. Be sure to read until the end for an exclusive 50% discount only for Online Makeup Academy readers to create your website portfolio on the WIX.COM platform! 1) Finding a photographer (or if you are a photographer yourself, that’s an added bonus!) that you work well with will be essential to lay the foundation of your creative career and will be the key to creating a strong portfolio that expresses your artistry in the best light. 3) Finding a stylist is also a great addition to building a perfect team, but isn’t necessarily required if you are focusing on building a beauty portfolio. If you are looking to expand your client reach to fashion, then you will definitely want to consider a collaboration with a stylist to bring some great wardrobe on set. Otherwise, you (or the photographer) can request that the model bring basics (black always works!) to style with. If you are creating beauty shots, then most photos will be close ups, which may or may not even show any clothing. 4) A hairstylist will also be an essential partnership, this is someone that can potentially even become your partner as you begin your Makeup Artist career working with clients. Or even better? If you’re looking to add an added value to your client base and expand your portfolio, you can also educate yourself in Professional Hair Styling (which we uniquely offer in continuing education at the Online Makeup Academy! – more information on professional hairstyling benefits are listed in the “Complimentary Hair Styling” section below). - How can you find your perfect team? Networking! Online websites and social media are perfect to find fellow creatives who are looking to also build their portfolio. One of the most well-known platforms to find fellow collaborators is ‘Model Mayhem’. ‘Model Mayhem’ is an international platform (which you can search by opportunities within your location) and allows you to connect with other creatives (photographers, designers, stylists, etc.) to work on projects that will build your portfolio (and possibly even lead you to getting published, which is another major milestone in establishing your artistry and business!). Social media is also a perfect way to find creative collaborators, particularly through Instagram – search locally for creatives in your area (or beyond if you are willing to travel) that are aligned with your vision and reach out (and don’t be afraid to follow up!). Begin planting the seeds to building a great team of individuals that inspire your artistry, and in turn connect with talented individuals who share your same goals on a multitude of different creative platforms. When you build your portfolio it is important to have a consistent focus of what your specialties are. You will be communicating to potential clients through imagery – so it is important to stay cohesive and showcase your strongest imagery. You can have a wide range of specializations, but make sure that all images are strong, cohesive, and consistent with quality professional work. Alternatively, it is also absolutely okay to only have one sole focus and specialization! - Bridal, natural makeup and simple glamour, hairstyling is also extremely beneficial in this specialization, keep the look beautiful, clean, fresh, and timeless. - Beauty / Private Clientele, you will need a wide range of traditional beauty looks; natural, evening, glamour, classic smokey eyes and dark lips (for special occasions); having a wide variety of beautiful signature looks for private clients to see your artistry will help you stand out and establish that perfect client relationship. - Fashion (Commercial and/or Editorial), it will be important that you work with a stylist for these looks, building creative partnerships with designers and stylists will help you build your portfolio and create partnerships which are essential in the industry. Editorial is also important and allows for creativity based on the shoot, mood board, etc. Printed published work adds an extra value to your portfolio. - Film, Television, focus on working with actors, or other industry professionals that are looking for headshots, additionally you can assist on set a lead Makeup Artist – but this will usually require union based membership, so explore all of the potential opportunities to break into this field. - Special FX / Creative Artistry, you will need to highlight your skilled techniques – and typically this will connect with the Film and Television specialty above. Offering professional hairstyling services is a key added value to your portfolio and for potential clients. 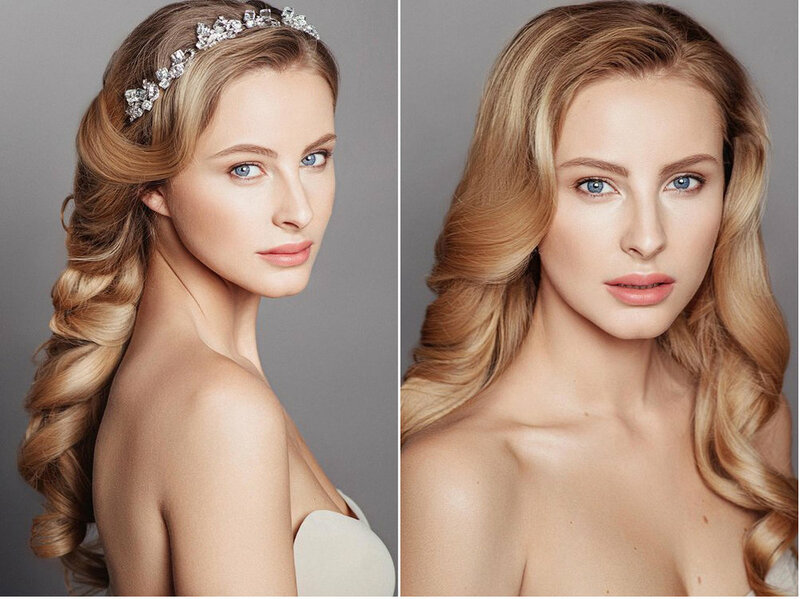 If you are looking to specialize in Bridal, offering hairstyling will be an essential element that will set your work apart from your competition. If a private client that is planning their wedding can hire only one artist on their special day, having both skills will provide an opportunity to offer both makeup and hair expertise directly to them, setting yourself apart from the competition and establishing yourself as a well-rounded beauty industry professional. It also opens up opportunities for the entire bridal party, as hair and makeup are key elements that are needed for everyone on the special day! At the Online Makeup Academy we are the only online educational platform that offers continuing education in Professional Hairstyling Techniques, as our goal is for our students to become well rounded Freelance Professional Artists, and offering the flexibility of a unique skillset is a major key to industry success. Once you’ve worked on creating great imagery with your professional collaborators, the goal is to have plenty of photographs to select from. Curating your best content is always important, as what you share will need to stand out and showcase your skill set and top techniques. It is important to highlight your best work, and not over share all of your work as you need to be sure to keep the viewers interested and wanting to come back for more! If you’re having trouble editing your work, ask for opinions from your personal network that you can trust to help you select key imagery. Remember, you can always edit and expand your portfolio, so don’t be afraid to switch things up from time to time! Now it’s time for your work to be seen! An online portfolio showcased through your own unique website and domain will highlight your work and reach far beyond your own community network – marketing to potential clients and collaborators from all over the world and planting the seeds for unique opportunities as you build your business. This website will be your one stop destination to showcase your professional work, provide information about your brand and business, and allow potential clients and industry collaborators to connect and communicate with you. Be mindful of all of the design elements and how it reflects your unique aesthetic and individual brand vision. In most cases, it is best to design minimally, so your portfolio work and artistry is the main attraction that stands out. Luckily, you don’t have to be a web developer to build a professional and modern website. There are web building platforms that will do it all for you, and all that you will have to do is decide on the layout, drag, and drop! Online Makeup Academy has partnered exclusively with Wix.com (one of the leading website portfolio building platforms available on the market) to offer an exclusive 50% discount to our readers – allowing you to build the website that you’ve dreamed of and effectively launch your brand and business! The Wix platform does all of the work for you – all you have to do is have your content ready and pick the template theme (tip: select a portfolio based template as there are several specific fashion/beauty templates that are stunning)! to get 50% off the yearly plan. Have a website and portfolio that you’ve created that you’d like to share with us? We’d love to see! Please send an email to info@onlinemakeupacademy.com; we are always eager to promote our student’s artistry and business within our community!